With thousands of exhibitors and more than 100,000 visitors descending upon Houston, Texas, in early May for the Offshore Technology Conference, how can you optimize your brand’s experience and drive success? With the help of 2020 Exhibits, that’s how. Located just a short distance from Houston’s NRG Park (formerly Reliant Park), home to OTC2018, 2020 Exhibits’ seasoned team of exhibit and event experts can develop and deliver a successful OTC2018 event experience. 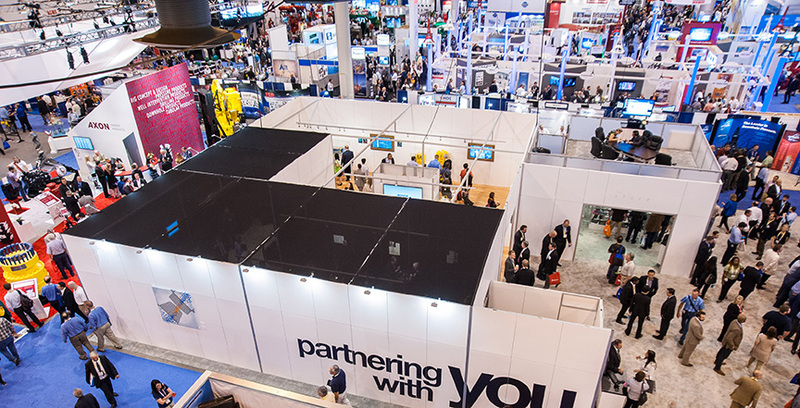 2020 Exhibits creates and designs custom environment exhibit rentals, including double deck and tradeshow display solutions for leaders in offshore energy and resources. With one of the largest custom modular and portable tradeshow display rentals in the country, featuring a wide range of award-winning double deck exhibits, custom booth fabrication and custom OTC tradeshow exhibits and tradeshow rentals, our award-winning in-house design, graphics and large-format printing capabilities can simplify the process. Our team provides the freshest ideas, high-impact marketing and dynamic, award-winning oil & gas tradeshow exhibits to capture attention and drive results. Whether the overall Offshore Technology Conference strategy and marketing objective is increased brand exposure and recognition, hospitality, product and service demonstrations private meetings or a dynamic presentation, the possibilities are expanded exponentially when using a double-deck or two-story exhibit. Drive powerful, engaging face-to-face experiences to showcase your products and services at the Offshore Technology Conference with interactive audio visual and digital media including interactive video walls. From dynamic and vibrant video walls to 90” monitors and 80” monitors, touch screens, 3D animation services, multimedia presentation design, after effects, iPad apps and multi-screen environments you can showcase your brand, big and bold, across the show floor. With interactive displays and engaging A/V rentals including seamless video walls, AV displays, touch screens and interactive touch tables, rich media content can create memorable and unique OTC2018 brand experiences. Delivering powerful interactive and engaging brand experiences worldwide, 2020 Exhibits has the creative, operational and international expertise to ACCELERATE YOUR BRAND and bring it to life with innovative and dynamic custom OTC2018 exhibit environments. With a well designed, creative tradeshow strategy and presence, we help clients from around the world reach key objectives, create lasting impressions and achieve top results. Maximizing our resources, we deliver creative, innovative and effective tradeshow experiences. Let’s get started.